This is a walnut (Juglans spp.) 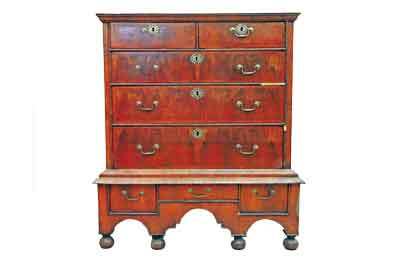 chest on a stand, also called a high chest of drawers or a highboy in the US. It is a fine example of the William-and-Mary-style furniture that appeared in England from the late 17th century and was made well into the 18th century. It is formed of two parts: an upper section, which is a chest of drawers with two short and three long graduated drawers, and a stand with three short drawers and an arch-shaped apron. 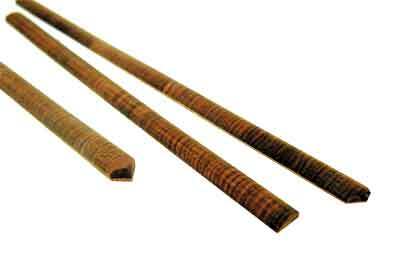 The primary wood used for the frame construction is pine (Pinus spp.) and the secondary woods are oak (Quercus spp.) 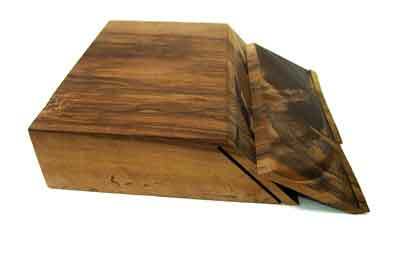 used for the top, sides and drawer structure, and walnut in which the front is veneered. The construction of the upper case is typical 17th-century pinned mortise and tenon frame, but features like the drawer stops glued on the backboard and the drawers divided by single half-rounded moulding and lapped dovetails are typical for pieces made around the 1710s. 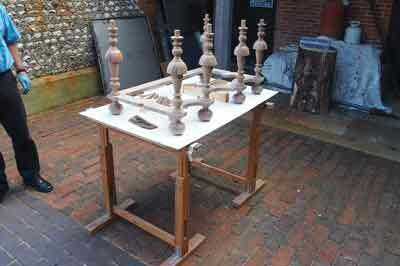 When the piece arrived at the West Dean College workshop it was mounted on bun feet. The proportions looked wrong, suggesting that the chest should be mounted on pillar legs instead of bun feet, and the top was not veneered. Most surviving examples of chests on stands have turned legs and even though there are examples supported only with bun feet, in such cases the top would have been veneered as it was a visible part of the furniture. 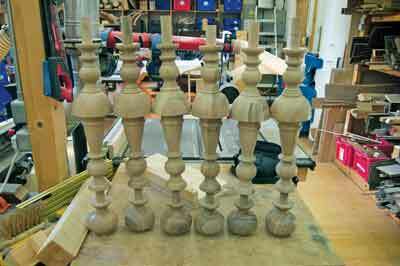 With turned pillar legs the piece would be about 1,500-1,600mm tall. Bearing in mind that people were shorter in those days, this would still have been tall enough for the top not to be seen. This led me to the decision to remake the stand, which involved turning six legs with new bun feet and making a stretcher. Other work that had to be done was to complete missing beadings surrounding the drawers and feather-banding. I started off preparing three designs for the new stand based on historical examples. As a reference for the stretcher's form, the shape of the apron was chosen - a solution commonly used in period pieces. The stand was to be constructed in the authentic manner of the period. Bun feet should be turned with a 75mm long dowel, which would go through a hole in the stretcher and into the bottom of the leg. 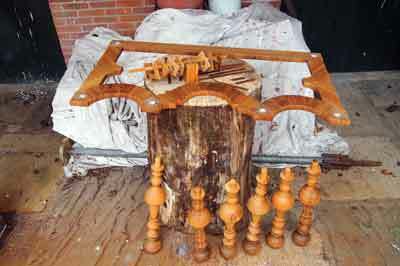 These would be turned in a similar way with a dowel at the top to locate into a supporting block glued behind the apron of the stand. I used 75mm square European walnut for turning the legs and bun feet for the cabinet, as it is richer in figure than that of English walnut. 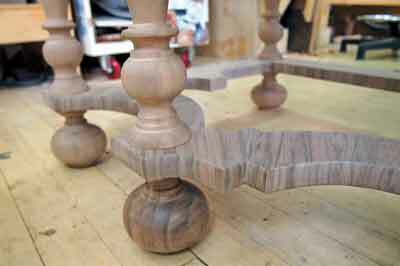 To create the cup, the widest part of the leg, two walnut sections were glued on the sides. 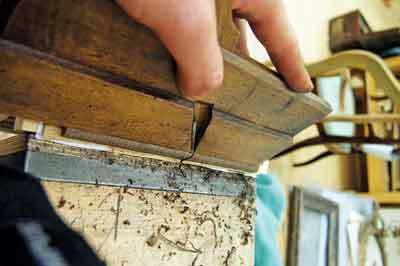 In original pieces from the period this would be a square block with four pieces glued at the widest point. This way as little material as possible would have been wasted. I had the opportunity to be more wasteful and decided to have less gluing joints. I started working on the stretcher by veneering directly onto the unshaped pine boards. The veneers used in the 17th century were much thicker than modern ones as they were cut by hand from a solid billett using a frame saw. I used 2mm-thick walnut veneer going cross grain on the 20mm-thick pine substrate. I marked centre points for each of the arches on the stretcher, with additional radial lines to help orientate the veneers in an arc around the front of the stretcher. Between the arches the veneers created a herringbone pattern that corresponds well with the feather-banding on the drawers. The sides were also veneered with a cross-grain pattern at a 45° angle and book-matched to create the same impression of feather-banding. 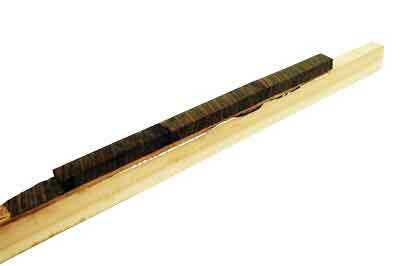 The back rail was veneered along the grain, as it would hardly be seen. When all the veneer pieces were cut to size, they were hammer veneered in turn. 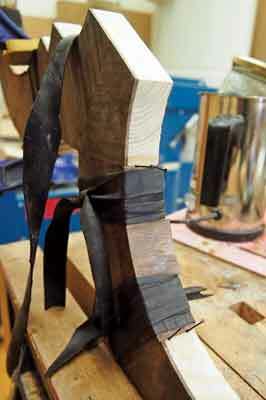 Each part of the stretcher was veneered separately before shaping, which allowed for easier handling. 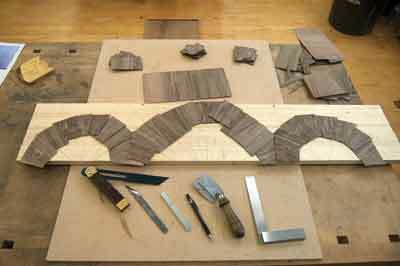 I started by cutting the shapes roughly on a bandsaw and finished with a combination of spokeshaves, files and wooden blocks with abrasive paper. The next stage was to veneer the edges. The cross-grain pattern followed through from the top of the stretcher down onto the edges. To hold the veneer in place while the hot glue cured I used a combination of rubber bands wrapped around the substrate and veneer pins to prevent sliding. This type of chest typically stands against a wall, so the back rail of the stretcher would not be seen and so in keeping with historical practice was not veneered. The individual components were lap-jointed front and back on the top of the sides and glued together. 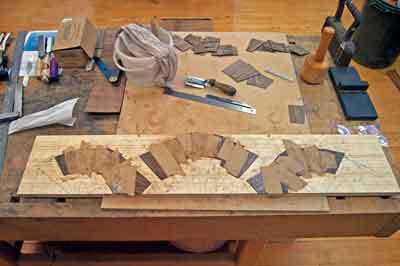 The corners, which had to be left uncovered for gluing, were then veneered. To make the stretcher I used well over 100 separate pieces of veneer. The last stage of making the stretcher was to round off the edges, so the strong line of the thick veneer would disappear. 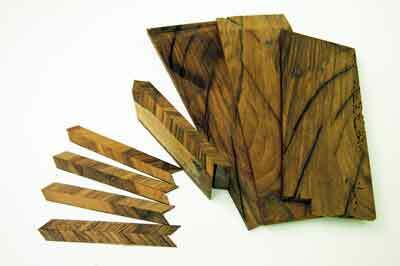 I used French hand-cut files and wooden blocks with abrasive paper for smoothing them out. Many parts of the beadings surrounding the drawers were missing or were poor replacements. The decision was taken to replace these and I chose walnut with a strong, stripy figure. I prepared small short-grain sections from a 12mm-thick piece of walnut cut into strips and backed them onto thick oak veneer as they were extremely fragile and tended to break when worked. 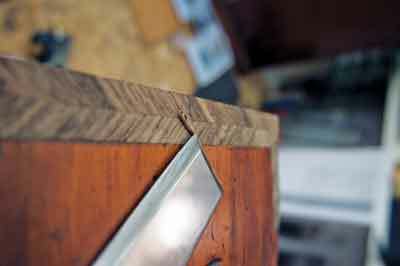 For easier clamping in the bench vice, whole strips were glued onto a strip of pine before shaping with a combination of moulding and block planes. This method enabled me to accurately recreate the profile and pattern of the original beadings. Although cross-banding, feather-banding or herringbone look like no more than decorative elements around the drawers, they have in fact a very practical function. The banding was added to protect the corners of the veneers on the drawer fronts from snapping off when sliding the drawer in and out repeatedly. A strip of feather-banding would have been considered almost as a sacrificial element. Instead of destroying expensive veneers, which when broken would need patching, only the strip around them would be damaged and need to be replaced. So the feather-banding on the chest I was working on had to fulfil its function very well, and many fragments of it needed to be completed. 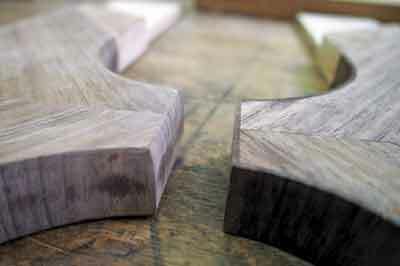 To remake them, I started by cutting two 10mm boards from a 50mm-thick solid piece of walnut. The cut was taken at a 45° angle. 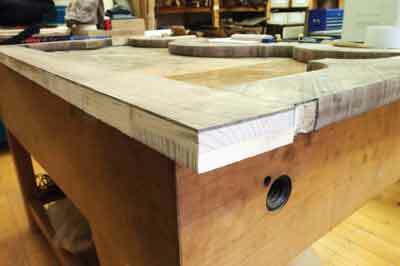 The face sides were planed and glued so that the grain was directed towards the glue joint. Later, I could just cut the end grain strips with a perfect feather-banding pattern ready for patching. As can be seen on the repairs to the feather banding on the drawers, 300 years of light exposure had made a significant difference to the colour of the walnut veneers on the chest. I now had to somehow treat all the newly made parts to match them to the original but faded veneer. A series of bleaching tests showed that the most necessary colour, light orange, could be achieved with nitric acid - HNO3. A brush application could cause problems with overlapping strokes, so I decided to build a tent in which the new stand, with beadings and feather-banding, could be fumed. Nitric acid vapours are particularly effective at oxidising organic molecules. 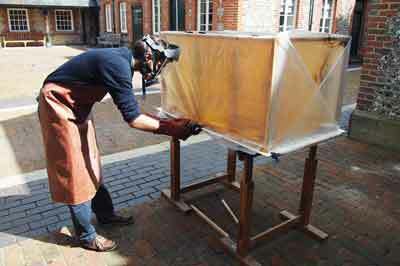 The fumes are produced when a small piece of copper alloy - brass - is dropped into a container with nitric acid. Good preparation is the key as the chemical reaction is very fast. The new timber remained in the tent for around 20 minutes. Appropriate precautions were taken to carry out this part of the process safely; the tent was constructed outside, access to the area was restricted to those wearing respiratory equipment, goggles, rubber gloves and aprons. Traces of nitric acid after fuming the new timber could affect any finishing materials applied over them so it was important to carry out a thorough rinsing procedure. This involved washing down with acetic acid - C2H4O2 - followed by a water rinse. Before commencing any further colouring work, the surface was left to rest for a week. The finishing process for the new legs and stretcher involved colouring with a mixture of spirit stains and earth pigments sealed in shellac polish and, finally, waxing. Bits of dirt, which accumulate on old furniture from the mix of dust and wax, were imitated by painting thin dark lines in the corners and recesses with Van Dyke spirit stain. After the stand was assembled with the chest I distressed it so that it wouldn't look too new. Distressing had to be done after polishing and waxing so that the damage would appear consistent with the new surface finish. 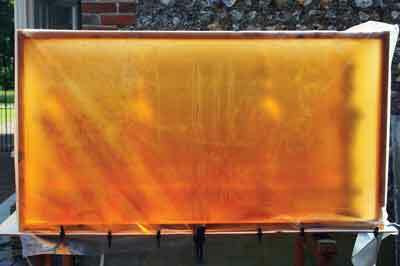 The purpose of the ageing process was not to fake the new stand to look old but simply to blend it in with the rest of the piece. The finish as well as the marks left by some modern power tools used during the process of making would leave no doubt that it was a modern alteration but also, for maybe a less trained eye, I engraved the date of making under one of the bun feet. 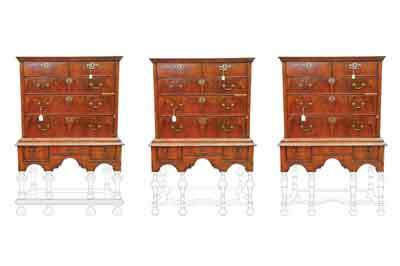 The form of the chest on a stand evolved from the chest of drawers; a style of furniture that was commonplace prior to the 18th century. These pieces typically stood in secondary rooms such as dressing rooms, closets, nurseries or workrooms.Â In the late 17th century chests of drawers were often placed on a low stand or frame, possibly for practical reasons and usually with a drawer in it. 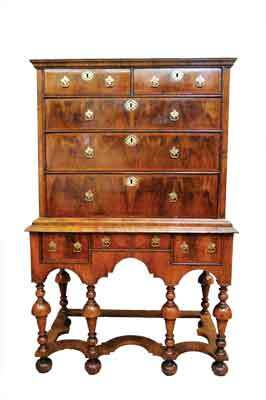 Chests of this sort continued to be made in the early 18th century. The change from a low to high chest implied more than a concern for improved storage capacity; it raised not only the height but also the status of the chest, giving it a visible presence equal to other large case furniture. But even with the higher status gained by placing the chest on the stand it still remained in private rooms. Today, the status of the chest on a stand is not a matter of much concern, but it has been very rewarding to see the piece restored to its original elegance. From the point of view of craftsmanship it was especially pleasing to decorate a piece of furniture successfully with a single type of timber used in several different ways. The rich figure of the veneers, the turned elements, the short grain section of the beadings, the cross-grained stretcher and end grain feather-banding are all of the same walnut, but the different ways of cutting it have given a marvellous impression of decorative variety.